NOAA/NESDIS SST Anomaly (°C) for Monday from ospo.noaa.gov. I am a Postdoctoral Research Scientist in the Biology and Paleo Environment Dividion at the Lamont-Doherty Earth Observatory. My research focuses on the El Niño Southern Oscillation (ENSO) and its role in global climate variability. I look at past changes in ENSO at different timescales - 1000, 10,000 and 100,000+ years - through analysis of deep-sea sediment archives. Changes in the chemistry of the preserved shells (or tests) of tiny creatures called foraminifera provide clues to past ocean conditions that help us better understand the relationship between ENSO and large-scale climate. 11/15/2016 - After another research trip to UC Santa Cruz, I have analyzed another 300+ individual G. sacculifer using LA-ICPMS. 08/28-09/02/2016 - Individual Foraminifera Analysis Workshop + ICP in Utrecht. 08/01/2016 - And now to the Atlantic! Research has begun on a single-foram project looking at seasonal and intra-seasonal SST variability in the equatorial Atlantic Ocean. 5/18/2016 - I've returned from another round of LA-ICPMS on individual forams at UC Santa Cruz. 1/31/2016 - The new year begins with new research at UC Santa Cruz. I've just returned from a 3 week trip to learn laser-ablation ICP techniques and to begin a project on ENSO change under varying boundary conditions using individual Line Islands foraminifera. 12/18/2015 - The editorial overview of Rustic et al. 2015 entitled "East joins West to complete a picture" is available online and in the latest issue of Science, and the paper is now in print!. 12/02/2015 - Rustic, Koutavas, Marchitto & Linsley, Dynamical Excitation of the tropical Pacific Ocean and ENSO variability by Little Ice Age cooling, Science, is now available online. 11/11/2015 - My grant proposal "Eastern tropical Pacific climate variability during the last glacial termination: How does ENSO respond to changes in climatic boundary conditions?" was funded by the LDEO Climate Center. Rustic, G. T., Koutavas, A., Marchitto, T. M., & Linsley, B. K. (2015). Dynamical excitation of the tropical Pacific Ocean and ENSO variability by Little Ice Age cooling. Science, 350(6267), 1537-1541. Data available at the NCEI data repository. Gerald T. Rustic, Athanasios Koutavas, Thomas M. Marchitto (2015). Late Holocene Sea Surface Temperature Trends in the Eastern Tropical Pacific, American Geophysical Union Fall Meeting 2015. Gerald T. Rustic, Athanasios Koutavas, Thomas M. Marchitto, Braddock K. Linsley (2014). Eastern Tropical Pacific Mean State and Variability During the Past 1000 Years, American Geophysical Union Fall Meeting 2014 (Oral Presentation). Gerald T. Rustic, Athanasios Koutavas, Braddock K. Linsley (2013). El Niño Southern Oscillation during the Medieval Climate Anomaly, American Geophysical Union Fall Meeting 2013 (Poster). Gerald T. Rustic, Athanasios Koutavas, Braddock K Linsley, Michael N Evans, Thomas M Marchitto, Timothy Herbert (2012). Variability of eastern tropical Pacific climate during the last two millennia from δ18O of individual foraminifera, American Geophysical Union Fall Meeting 2012 (Poster). Gerald T. Rustic, Chuixiang Yi (2011). Canopy Photosynthetic Capacity Signature of Extreme Events, American Geophysical Union Fall Meeting 2011 (Poster). Our ability to predict future climate conditions relies on a keen understanding of the climate system and the sources of past climate variability. The brevity of the instrumental record and the time-scale of past climate changes compels us to utilize the geologic record to reconstruct Earth’s climate history. My research focuses on climate variability on timescales relevant to human societies, in particular interannual-decadal scale climate variability and its relationship to different background climate states. Extreme events on these timescales can have major societal impacts, and it remains unclear how strongly this variability is forced by boundary conditions. My current research investigates the behavior of the El Niño Southern Oscillation (ENSO) through the Holocene and late Pleistocene, and I am beginning a project to understand modes of tropical Atlantic variability during the Holocene. I am also extensively involved with developing and testing a novel method for reconstructing variability using geochemical measurements of individual foraminifera. The largest source of inter-annual climate variability on Earth is the El Niño Southern Oscillation (ENSO). El Niño and La Niñ events are characterized by significant changes in tropical Pacific sea surface temperatures, with far-reaching effects felt across a wide portion of the globe as a result of the strong ocean-atmosphere teleconnections. The dramatic temperature and precipitation changes that occur during strong ENSO events can affect the health, safety, and food security of millions if not billions of people. Our understanding of the climatic factors that influence the severity and frequency of ENSO is incomplete, in part due to the relative brevity of the instrumental record. To better understand, characterize, and ultimately predict the response of ENSO to future climate conditions, we can look at how ENSO has responded to past changes in global climate. My research explores the mechanisms that affect ENSO variability and the relationship of ENSO to large-scale changes in the climate system which are fundamental to understanding tropical Pacific variability through the Holocene and on longer glacial-to-interglacial time-scales through the late Pleistocene. Studying the large-scale, long-term history of ENSO is done by looking at very smallest things. The geochemical signature of single-celled planktonic organisms called foraminifera, found in deep-sea sediments, can be used to reconstruct past oceanic conditions. 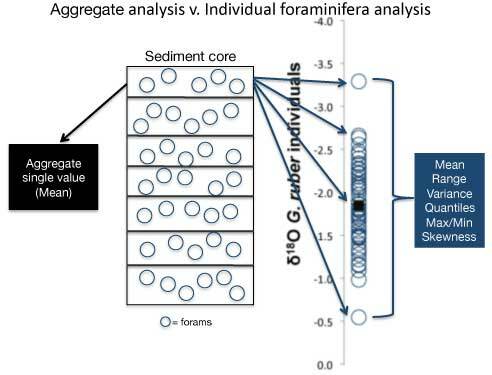 Aggregate analysis results in a single mean value for all of the foraminifera from an interval. Various population-level statistics can be obtained from individual analysis and compared across intervals to observe change in multiple dimensions. These magnificent little geochemists have shells, or tests, made of calcium carbonate (CaCO3). The oxygen isotope ratio (δ18O) of the test is related to the calcification temperature and water properties (salinity and δ18Osw). 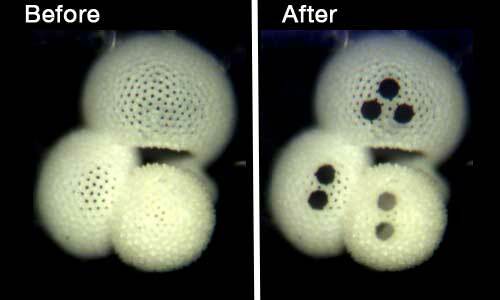 As each individual foraminifer has a life-span of roughly one month, careful analysis of the δ18O from individual shells provides multiple monthly "snapshots" of ocean conditions. With enough of these "snapshots", it is possible to infer not only the mean conditions, but also the variability of the ocean for the time that the foraminifera were alive. This climate information can then be compared to other time intervals to infer changes in ocean's mean state and its variability through time. High-resolution image of an individual G. sacculifer before (left) and after (right) laser ablation. Target size is 50 µm. In addition to δ18O, I use other geochemical tools to reconstruct past ocean conditions. Among these tools are the ratios of trace metals, specifically Mg/Ca, in the tests of foraminifera. 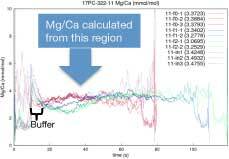 Mg replaces Ca as a function of calcification temperature, and thus the Mg/Ca ratios relate to the temperature during the foraminifera's lifetime. We can measure Mg/Ca ratios on aggregate samples of multiple crushed and cleaned foraminifera to provide us an estimate of the average temperature from the time interval we are studying. In order to measure the variability of ocean temperatures, we obtain the Mg/Ca ratios from individual foraminifera using laser ablation and inductively coupled mass spectroscopy (LA-ICPMS). This technique allows us to obtain detailed, chamber-by-chamber measurements of various trace metals (Al, Mg, Ca, Mn, Zn, Sr). Example of TRaCES output showing the raw trace metal traces, integration area of the traces, buffer zones, and running Mg/Ca values. I have written software (TrACES - Trace metal Automated Computation and Evaluation Script) to automatically calculate Mg/Ca ratios from the large amounts of raw data generated by LA-ICPMS that detects characteristic changes in the data stream, applies drift correction, detects and flags possible contaminants, and summarizes the data by chamber and by individual. Working with the top-notch laboratory staff at LDEO, I have developed methods for measuring the Mg/Ca ratios in individual foraminifera using solution chemistry techniques and modified chemical cleaning procedures. We have begun using Optical Emission Spectroscopy (OES) ICP-MS to measure individual foraminifera, which will allow for the use of the individual foraminifera method during time periods where oxygen isotopes may be adversely affected by changes in seawater δ18O from ice volume effects, large scale salinity changes, or other factors. Thesis Title: Polycyclic aromatic hydrocarbon contamination in and around the Arthur Kill, Staten Island, New York. Eastern tropical Pacific climate variability during the last glacial termination: How does ENSO respond to changes in climatic boundary conditions? Complete CV and references available upon request. Information about ENSO is coming soon. However, great information about ENSO can be found here at the NOAA ENSO portal. © 2016 Gerald Rustic, all rights reserved. 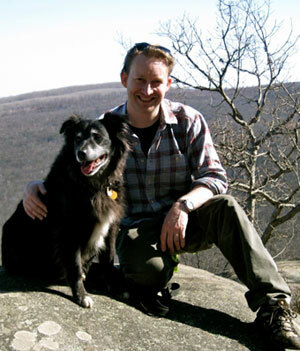 All of the information posted here is the opinion of the author and does not reflect the views and opinions of the Lamont-Doherty Earth Observatory, it's Trustees, Columbia University or any other party.